Hi, has anyone had any issues with the push in crown on the C65 Trident diver? I am looking to buy one and intend wearing it when I go swimming twice a week. With it not being screw in I have some reservations. I have never worn mine in water as it has become something of a "dress diver". I don't wear a watch at the gym & pool any more because I tend to end up in the sauna and steam room (not a watch friendly environment)...I keep a watch case in my gym bag, and there are clocks in every area. If I swim wearing a watch it tends to be on holiday when I only have the C60 GMT. I don't recall any issues being expressed on the forum. The watch has seals and gaskets to prevent water ingress to achieve the WR150m rating. ^^^ As stated above, as long as you do your due diligence before swimming and check you’ve pushed the crown in fully, I’d trust the seals. That’s what the 60/60 warranty is for anyway. Having said that, I won’t swim with mine because it came on the camel leather. I don’t think that’s waterproof? Before I knew (or cared) about such things, I used to swim regularly with 100m WR Seikos, most of which did not have screw down crowns. Never had a problem. Of course these days to walk out in the rain we seem to need 500m+ WR ratings and even then we check that the crown is securely screwed down. A bit of an exaggeration perhaps, but based on past experience, I suspect it’ll pass with flying colours. Unless you’re swimming below 150m, it’s waterporoof. No issues with mine at all. It has been worn in the bath, shower, general swimming in the pool and while doing the washing up. No issues at all. I trust the 150m rating (I’ve used an old Seiko beater with only 50m rating for all the uses above for over twelve years and had no issues with that either). If there were any issues I am sure CW would stand by their warranty. I’m planning/hoping to add the auto version of the C65 Diver in a few weeks and will fully expect to use it in a similar fashion. My understanding on this matter is (and I hope others will correct me if I’m wrong) that a screw down crown by itself does not define water resistance. It is a safety mechanism that ensures a crown will not be pulled out while moving about under water. The C65 Trident Diver’s crown, while push in/pull out, requires a somewhat firm pull to set the time (at least mine does). Therefore, I think that it will be fine for swimming. But if your circumstances are such that there is a greater than average likelihood of the crown bumping against something that could cause it to pop out, you might reconsider. Caveat: I have personally never taken my C65 under water. Too true. There has been a systematic "scepticism" put about wrt WR ratings - I should like to know who started this rubbish, but certainly some of the culprits are so called "reviewers" and their self important blogs. If it's pressure tested to whatever then it'll be fine to at least very near that depth (saltwater exerts 2.5% more pressure than freshwater) and most likely then some. Likewise this business of heat and steam affecting the seals - more rubbish. If your wrist can stand it then the watch will, though granted you may not like the possible corrosive effects on the case. I have done well over 100 dives at depths of up to 50m (5 ATM) using several different dive watches and dive computers (rated at least 100m) over the years and never a problem with leakage. I once (dive invitation during a business trip) even dived with a 1987 Rolex Datejust (100m rated) to 35m during a 40 minute dive and it was absolutely fine. The only problem I ever had was with a Breitling Chronograph (100m rated) in a pool - it flooded completely and Breitling agreed it was their fault, no questions asked and very handsomely rebuilt the watch, replacing the movement and dial. Forget all the scary stuff that's put about by armchair pundits and self-proclaimed "experts". If it's rated for it then it will be fine - but for peace of mind you can always have it pressure tested first at any decent watchmaker for a few quid. Slightly off topic, but I think a lot of our perceptions are skewed by the apparent depth rating of watches as opposed to what manufacturers say you can actually use them for! 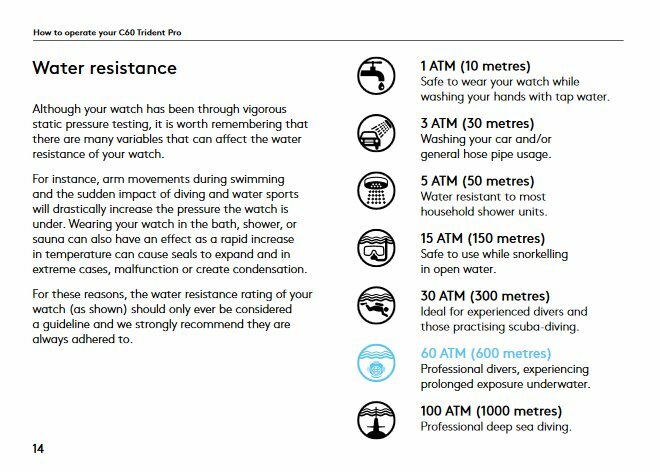 To have a 50m rated watch that the manufacturer says you can't swim in has always seemed like complete nonsense to me! Depending on the design, many screw-down crowns have a seal within the crown which compresses against the tube as it’s tightened, so adding an additional seal in addition to those seals located on the shaft of the stem. that chart is exactly the rubbish that I was calling out. May I ask the source? Either the watch is designed and pressure rated or it's not. I have a 200m Seiko Mini Tuna for my usual dive watch. According to that chart I should not be using it. One of my engineers used to have a great comeback (sic) for customer complaints: "I can see the fault with this, you've been using it haven't you?" I just picked that one out of a google search as an example. Extreme one, evidently.